Whether you want a tree in your garden thinned to give you more light without damaging it or a tree stump removed completely, we have the expertise and experience to carry out the tree work in a safe and efficient manner. 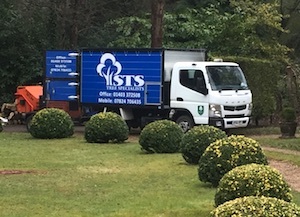 STS Tree Specialists are an ARB Approved Contractor which is a recognised benchmark for arboricultural contracting throughout the UK independently accredited by the UK's Arboricultural Association. Our team hold professional tree surgery qualifications up to Level 4 and are all CSCS qualified. All of our arborists are skilled tree specialists who can offer a professional tree service to keep trees manageable and healthy or removed completely. We work on all types of properties so are fine with tight spaces, awkward spaces, extra safety requirements, big jobs, small jobs, aesthetic purposes, safety concerns or necessary changes. Having such wide experience means we can adapt our services to your needs. Removing or felling trees including cutting trees down from the bottom or taking them apart from the top dependant on the space available. Removing tree stumps by grinding them up into chips which can then be used in other parts of the garden. Tree trimming and cutting including crown reduction and thinning, pollarding and general pruning and shaping. Tree reports and surveys for home owners, landlords, surveyors, local authorities and property consultants. All of our tree services are carried out with complete sensitivity to your requirements and situation. We can employ a variety of methods to get the job done and have the experience to know which to apply to best suit your property. We cover all of Sussex and Surrey and the surrounding areas including Horsham, Southwater, Crawley, Cranleigh, Billingshurst, Storrington, Rudgwick, Henfield, Dorking, Reigate and Banstead. If you’re unsure which of our tree services would be best suited to your needs, just give us a call and we would be very happy to advise you.